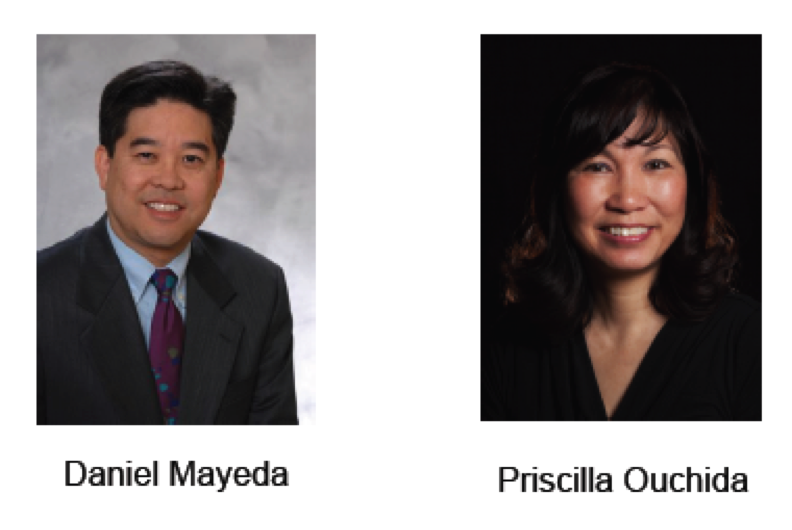 WASHINGTON, D.C. – Today, the Asian Pacific American Media Coalition (APAMC) announced that Daniel M. Mayeda of East West Players (EWP) and Priscilla Ouchida of Japanese American Citizens League (JACL) have been elected as its new Co-Chairs. The APAMC, a Coalition comprised of civil rights and media activism organizations, further announced that it will be expanding and redefining the scope of its activities. Mayeda, a founding member of the APAMC, is a longtime Member of the Board, Legal Counsel and Past President of East West Players, the nation’s largest producing organization of Asian American artistic work. EWP operates out of an historic building in downtown Los Angeles’ Little Tokyo district and engages in a variety of activities, including the presentation of plays ranging from world premiere works about the Asian American/Pacific Islander (AAPI) experience to Broadway musicals featuring AAPI talent; an actor’s conservatory; the David Henry Hwang Writers Institute; A.C.T.S., an actors’ and writers’ professional development network; a vibrant theatre for youth program; and an advocacy arm. In 1999, as part of a national multi-ethnic coalition, Mayeda and EWP helped negotiate Memoranda of Understanding with ABC,CBS, Fox and NBC requiring each of the four major television networks to institute programs designed to increase diversity both in front of the cameras and behind the scenes. As the longest running theatre of color in the country, EWP has worked in partnership with the networks and film and television studios to help facilitate a strong pipeline of AAPI creative talent to Hollywood. Ouchida is the Executive Director of Japanese American Citizens League, the nation’s oldest and largest Asian American civil rights organization. Organized in 1929, JACL is dedicated to protecting the civil rights of Asian Americans. JACL serves on the Comcast/NBCUniversal Joint Advisory Council, and is associated with the Minority Media and Telecommunications Council. JACL also participates on issues before the Federal Communications Commission relating to minority participation. JACL led efforts to address concerns with films produced by Paramount and Time- Warner. JACL conducts school programs that tackle racially-motivated violence and defamatory speech, and is actively involved in addressing anti-Asian bullying and hate crimes. The organization is a member of major civil rights coalitions including the Leadership Conference on Civil and Human Rights and the National Coalition of Asian Pacific Americans. The APAMC was formed in 1999 after it, the NAACP, and Latino and Native American organizations were appalled that of the 26 new television series offered by the four major networks, none starred a person of color. To hold the networks accountable for their prime-time programming, the Multi-Ethnic Coalition began issuing annual report cards and regularly meeting with the top network creative executives. The APAMC has succeeded in raising awareness of the lack of AAPIs on the air and has seen a marked increase in Asian American representations on screen, in writers’ rooms and in the executive suites. The APAMC’s initial Chair was former Congressman Norman Mineta. Karen K. Narasaki, former President and Executive Director of the Asian American Justice Center, replaced him as Chair and served for 11 years. For the past two years, the APAMC has been led by Guy Aoki, Founding President of the Media Action Network for Asian Americans (MANAA), and Marilyn Tokuda, Arts Education Director at EWP. While Co-Chairs Aoki and Tokuda are rotating off as the heads of the APAMC, they will continue to be active in the Coalition’s work. “We also were successful in strengthening our partnership with the networks, including participating in Fox’s ‘Seizing Opportunities’ forum for creative executives, bringing NBC creative executives to EWP to meet with AAPI actors and assisting in CBS’ efforts to cast more local talent suitable for HAWAII 5-O,” added Tokuda. Mayeda remarked, “The APAMC is grateful for the leadership of Guy and Marilyn in trying to improve the way Asian Pacific Americans are portrayed in the media and, therefore, how our community is perceived and treated by society. We especially applaud their vision in challenging the networks last year to put on the air within the next three seasons a television series starring an AAPI actor.” That challenge appears to have lit a fire under the networks and has already resulted in Fox premiering the groundbreaking MINDY PROJECT series whose star, creator, writer and executive producer is Indian American Mindy Kaling. The Coalition also announced that it will seek to expand the scope of its influence to encompass other important entities such as advertising agencies, major advertisers, talent agencies, talent guilds, and AAPI writers, directors and actors. The Asian Pacific American Media Coalition has agreements with ABC, CBS, FOX and NBC committing them to work to increase diversity on-screen and behind the camera.